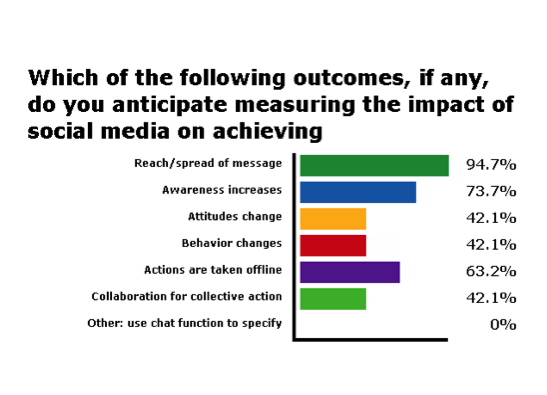 Measuring the Impact of Social Media: What Happens Offline? As we examine the online impact of our social media activities, a question that often comes to mind is: Can we reliably measure whether people’s online engagement influences their actions and behavior offline? During a recent webinar, held as a follow up to a spring 2013 Robert Wood Johnson Foundation (RWJF) conference that began a sector-wide conversation about how to determine the effectiveness of using social media to advance causes and issues, three foundations shared how they’re assessing what they’re learning about their separate online activities. Presenters discussed a newly created RWJF Leadership Group on LinkedIn, the Irvine Foundation’s infographic and online campaign around Linked Learning, and the MacArthur Foundation’s use of a social network analysis to map online connections and behaviors of grantees within their digital media and learning initiative. It’s a tool-rich environment for evaluations. From Google analytics to HootSuite and Topsy, it’s easy to get lost in the weeds choosing an analytics tool. Where should you begin? First, define your goals. What outcomes are you trying to measure? What tools will help you measure these results. Beth Kanter’s Pinterest Board is a good resource for learning more about social media analytics tools. Experimentation and adaptation is key. This is probably the most important takeaway. Throughout your online campaign, it’s important to take a step back and evaluate what’s working (and what’s not) and to adapt your strategy accordingly. For example, Google Analytics showed that email was driving more page views on the Irvine Foundation’s Linked Learning infographic than social media. Here was an important lesson: Social media does not work in a vacuum; it’s just one part of an overall communications plan. With these two bits of wisdom in our back pockets, the question remained: How can the field move forward to effectively measure social media impact? Reduce the barriers to access. Like much of social media, it’s a numbers game. The more eyes on your social media campaign, the higher the likelihood of engagement offline. Know your target audiences, create the content that they’d value most, and most importantly, enable them to access it. 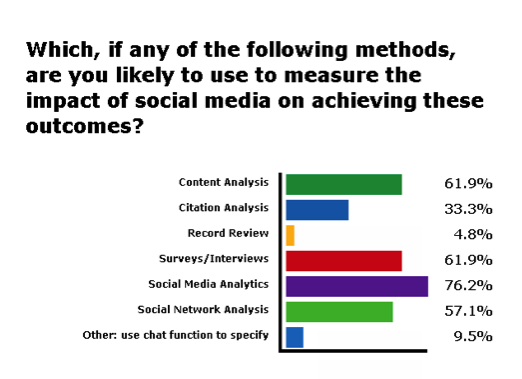 While social media analytics remain the most popular method for measuring impact, it was good to see that alternative, tried and true methods like surveys and interviews were still viewed as important. Where do you see opportunities for measuring impact? Which measurement tools have you found most helpful? 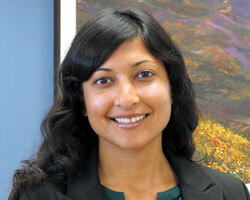 Joyce C. Sood (@joycesood) is Digital Communications Officer for the James Irvine Foundation. For tools, resources and updates on the state of practice of measuring the impact of social media, visit this special section on the Robert Wood Johnson Foundation website.